EVER eyed up your motherin-law’s detached period home? Sitting on an acre in a leafy suburb? Lofted hall features, a graceful original staircase – whatever about the potential out the back. Why she can’t just, well give it to you? After all, she spends most of her time in the kitchen, never heats the place. Even on Christmas Day all you get is a gas heater and some deckchairs in the living room. The things you could do with that attic. It’s unfair isn’t it? I mean why should the elderly have big old houses, and not us? Especially as they’re not making use of the space. We get the dregs. The over priced one beds for a family of four in a new build. 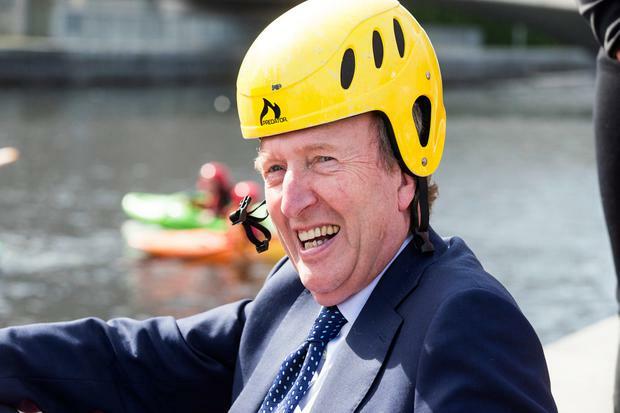 Luckily Shane Ross has a solution. “Granny-flat grants” are aimed at meeting the needs of older people by splitting their homes into two separate units. The grants would be great for “converting under-occupied family homes” into “self-contained ground floor accommodation suitable for the needs of the older home owner” while the upstairs area would become available for lodgers or family. Parents in their prime, wondering why they’re stuck in the garden flat with no sunlight when they still like to listen to Led Zeppelin from time to time and now have to listen to the pitter-patter of toddler feet on the wooden floors above. I’m being devil’s advocate here, but these things do need to be considered, in the greater scheme of things, should the grant become available. We don’t know the terms and the financials have yet to be trashed out, but very often when you mix property, family, money and inheritance in a giant cauldron, the perfect storm bubbles and thickens. Obviously the party moving in has to have a secure tenancy, otherwise things get really tricky. Then there’s the issue of care. Will they get all the care responsibility because other siblings will see it as a fair exchange for getting to live in the family home? Everyone is right and everyone is wronged. All is fair in love and the property war after all. Also, it’s assumed that granny or granddad will have their lives uprooted without a second thought. The older we get, the more we get set in our ways and upheaval can cause untold stress. My German granny scared off her lodgers and didn’t want to go to an old people’s home, so we cared for her until she passed away. What really needs to be addressed in Ireland is decent homecare. The national queue for people awaiting HSE homecare has climbed to more than 6,100 with Mayo, Roscommon and Galway counties having in excess of 1,500 people on a waiting list for home help or homecare packages. I look forward to the day when the “empty nest” pensioners aren’t targeted yet again, in another display of granny economics. It seems, in Ireland, a country which proudly boasts that it’s first in so many things, the populace can’t stand on its own feet and ultimately still needs granny to sort us out with everything from homes to childcare. The average rent in Luxembourg is the same as in Ireland and yet people have a very high quality of life and they can just afford to live down the road or beside their ageing parents. Obviously, the way rents are going we can no longer do that. How long will it be before we embrace the idea of the sort of coffin flats they have in Hong Kong?